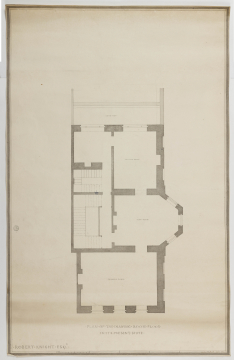 This survey plan shows the first floor as altered for Lady Pembroke ( see drawing  of Soane's surveys and designs for her ladyship). The two rooms facing the garden were kept as such though merged in the later designs for Robert Knight (q.v.) A 'lead flat' lies beyond the front facing the garden.